Belkin Clamp-On Surge Protector | OhGizmo! 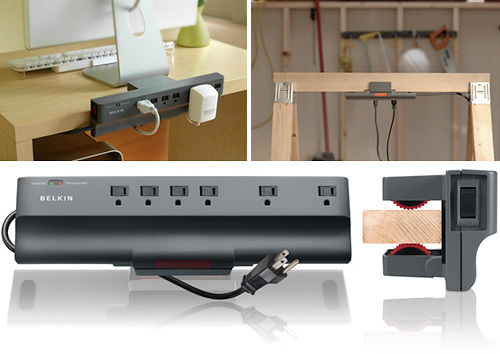 Belkin’s come up with a simple way to make your everyday surge protector a lot more useful. The Clamp-On is pretty self-explanatory, but in case the name’s gone over your head, it’s basically got a clamping device on the back that allows it to be attached to anything up to 1-1/2 inches thick. The most obvious use is attaching it to the edge of your desk or the back of your entertainment center, but you construction types can also clamp it onto a workbench or saw horse. It has a generous 10-foot power cord, and uses a set of wheels with rubber ‘grip teeth’ to securely hold onto whatever you attach it to. That way you don’t always have to climb under your desk, or pull your entertainment center out from the wall in order to plug something in. It also comes with a $15,000 connected equipment warranty, which is nice if one day the Clamp-On fails to protect your gear from surges. You can get the Clamp-On directly from Belkin for $40.99. I actually have a couple of these at my home. Belkin has sponsored both BarCamp LA and BarCamp SD in part by dishing out some of these fancy little doohickeys. Some of the barcampers took them home afterwards. I ended up with one remora’d onto my tv stand, letting a variety of geek toys succle power from its proverbial teet.